John Fredriksen's Frontline Ltd. (Frontline) has entered into a contract with Zhoushan Jinhaiwan Shipyard Co.,Ltd. in China for delivery of four 320,000 dwt VLCC newbuildings. John Fredriksen's Frontline Ltd. (Frontline) has entered into a contract with Zhoushan Jinhaiwan Shipyard Co.,Ltd. in China for delivery of four 320,000 dwt VLCC newbuildings. The vessels will be delivered from June 2011 until December 2011. Frontline has also secured options for further two similar VLCC newbuildings at a fixed price. Frontline says "the ordering of the tonnage has been done as a function of a positive market outlook, attractive contract price and payment terms, and is supported by the wish to continuously renew the fleet. Frontline's affiliated company Golden Ocean Group Limited has very good experience with the quality and deliverability of Jinhaiwan shipyard. It has been of vital importance for the Board that the deal can be executed and financed without significantly reducing Frontline's dividend capacity in the short to medium term. 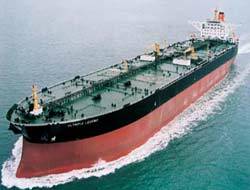 The ordering confirms Frontline`s position as a leading operator of quality VLCC tonnage."